When you join Avon leadership you begin earning a passive income!! To explain in simple terms.....you earn money while you sleep! Ok seriously, who doesn't want to earn money while doing nothing?!? Now this chart may seem daunting so that is why I am going to break it down by category to simplify it for you. 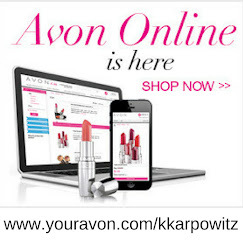 Avon Promotor- As an Avon Promotor you need $50 in personal sales with one 1st generation order. Total Team Sales are not applicable at this title. You will receive a $20 Qualified Recruit Bonus and a 3% sponsoring bonus. Advancement and generation bonuses are not applicable at this Avon achievement title. Avon Star Promotor-As an Avon Star Promotor you need $50 in personal sales with two 1st generation orders. Total Team Sales are not applicable at this title. You will receive a $20 Qualified Recruit Bonus and a 3% sponsoring bonus. Advancement and generation bonuses are not applicable at this Avon achievement title. Avon Bronze Ambassador-As an Avon Bronze Ambassador you need $200 in personal sales with 3 1st generation orders. You will need $1,000 in total team sales. 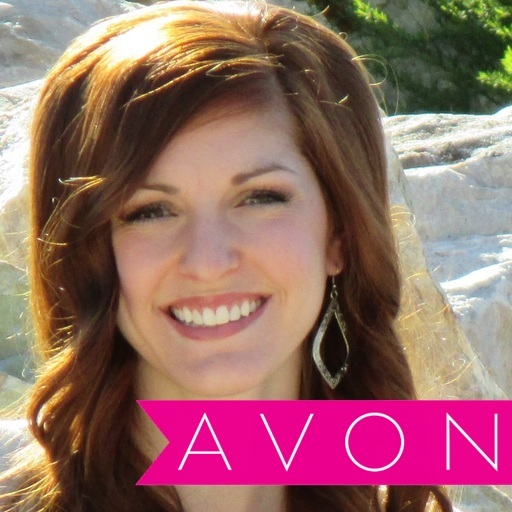 There are no 1st generation title requirements as an Avon Bronze Ambassador. You will receive a $20 Qualified Recruit Bonus and a 3% sponsoring bonus. When you advance to the title of Avon Bronze Ambassador you will receive an Advancement Bonus of $500 (deposited over the 4 following campaigns as long as you maintain the title). When you mentor someone who achieves the title of Avon Bronze Ambassador you will receive a Mentor Bonus of $250 (deposited over the 4 following campaigns as long as they maintain the title) You will receive a Generation Bonus of 3% for your first and second generation Avon Representatives. Avon Silver Ambassador-As an Avon Silver Ambassador you need $200 in personal sales with 6 1st generation orders. You will need $2,000 in total team sales. There are no 1st generation title requirements as an Avon Silver Ambassador. You will receive a $20 Qualified Recruit Bonus and a 3% sponsoring bonus. When you advance to the title of Avon Bronze Ambassador you will receive an Advancement Bonus of $750 (deposited over the 4 following campaigns as long as you maintain the title). When you mentor someone who achieves the title of Avon Silver Ambassador you will receive a Mentor Bonus of $375 (deposited over the 4 following campaigns as long as they maintain the title) You will receive a Generation Bonus of 4% for your first generation and 3% for your second generation Avon Representatives. Avon Gold Ambassador-As an Avon Gold Ambassador you need $200 in personal sales with 9 1st generation orders. You will need $4,000 in total team sales. There are no 1st generation title requirements as an Avon Gold Ambassador. You will receive a $20 Qualified Recruit Bonus and a 3% sponsoring bonus. 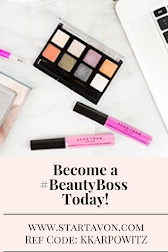 When you advance to the title of Avon Silver Ambassador you will receive an Advancement Bonus of $1,000 (deposited over the 4 following campaigns as long as you maintain the title). When you mentor someone who achieves the title of Avon Gold Ambassador you will receive a Mentor Bonus of $500 (deposited over the 4 following campaigns as long as they maintain the title) You will receive a Generation Bonus of 5% for your first generation, 3% for your second generation, and 2% for your third generation Avon Representatives. Avon Bronze Leader-As an Avon Bronze Leader you need $200 in personal sales with 10 1st generation orders. You will need $8,000 in total team sales. You will need one 1st generation Avon Silver Ambassador for the Title Requirement. You will receive a $20 Qualified Recruit Bonus and a 3% sponsoring bonus. When you advance to the title of Avon Bronze Leader you will receive an Advancement Bonus of $1,500 (deposited over the 4 following campaigns as long as you maintain the title). When you mentor someone who achieves the title of Avon Gold Ambassador you will receive a Mentor Bonus of $750 (deposited over the 4 following campaigns as long as they maintain the title) You will receive a Generation Bonus of 6.5% for your first generation, 3% for your second generation, and 2% for your third generation Avon Representatives. Avon Silver Leader-As an Avon Silver Leader you need $200 in personal sales with 10 1st generation orders. You will need $12,500 in total team sales. You will need two 1st generation Avon Silver Ambassador's for the Title Requirement. You will receive a $20 Qualified Recruit Bonus and a 3% sponsoring bonus. When you advance to the title of Avon Silver Leader you will receive an Advancement Bonus of $2,000 (deposited over the 4 following campaigns as long as you maintain the title). When you mentor someone who achieves the title of Avon Silver Leader you will receive a Mentor Bonus of $1,000 (deposited over the 4 following campaigns as long as they maintain the title) You will receive a Generation Bonus of 7.5% for your first generation, 3% for your second generation, and 2% for your third generation Avon Representatives. Avon Gold Leader-As an Avon Gold Leader you need $200 in personal sales with 10 1st generation orders. You will need $20,000 in total team sales. You will need two 1st generation Avon Silver Ambassador's for the Title Requirement. You will receive a $20 Qualified Recruit Bonus and a 3% sponsoring bonus. When you advance to the title of Avon Gold Leader you will receive an Advancement Bonus of $2,500 (deposited over the 4 following campaigns as long as you maintain the title). When you mentor someone who achieves the title of Avon Gold Leader you will receive a Mentor Bonus of $1,250 (deposited over the 4 following campaigns as long as they maintain the title) You will receive a Generation Bonus of 8.5% for your first generation, 3% for your second generation, and 2% for your third generation Avon Representatives. Avon Bronze Executive Leader-As an Avon Executive Bronze Leader you need $200 in personal sales with 10 1st generation orders. You will need $40,000 in total team sales. You will need two 1st generation Avon Silver Ambassador's for the Title Requirement. You will also need one 1st generation Avon Gold Leader's for the Title Requirement.You will receive a $20 Qualified Recruit Bonus and a 3% sponsoring bonus. When you advance to the title of Avon Bronze Executive Leader you will receive an Advancement Bonus of $3,000 (deposited over the 4 following campaigns as long as you maintain the title). When you mentor someone who achieves the title of Avon Bronze Executive Leader you will receive a Mentor Bonus of $1,500 (deposited over the 4 following campaigns as long as they maintain the title) You will receive a Generation Bonus of 9% for your first generation, 3% for your second generation, and 2% for your third generation Avon Representatives. You will also Receive a Gold Leader + Bonus of 2%. This bonus is based on the achievement title of Gold Leaders and above in your down line. As an Avon Executive Leader you can also qualify for the Executive Leader Cash Bonus of up to $400 per campaign! $150 for the initial 1st generation Gold Leader performing at that level and $50 for every subsequent 1st generation Gold Leader, up to a maximum of six, e.g. $150=(5 x $50)=$400! Avon Silver Executive Leader-As an Avon Executive Silver Leader you need $200 in personal sales with 10 1st generation orders. You will need $100,000 in total team sales. You will need two 1st generation Avon Silver Ambassador's for the Title Requirement. You will also need two 1st generation Avon Gold Leader's for the Title Requirement.You will receive a $20 Qualified Recruit Bonus and a 3% sponsoring bonus. When you advance to the title of Avon Silver Executive Leader you will receive an Advancement Bonus of $5,000 (deposited over the 4 following campaigns as long as you maintain the title). When you mentor someone who achieves the title of Avon Silver Executive Leader you will receive a Mentor Bonus of $2,500 (deposited over the 4 following campaigns as long as they maintain the title) You will receive a Generation Bonus of 10% for your first generation, 3% for your second generation, and 2% for your third generation Avon Representatives. You will also Receive a Gold Leader + Bonus of 2%. This bonus is based on the achievement title of Gold Leaders and above in your down line. As an Avon Executive Leader you can also qualify for the Executive Leader Cash Bonus of up to $400 per campaign! $150 for the initial 1st generation Gold Leader performing at that level and $50 for every subsequent 1st generation Gold Leader, up to a maximum of six, e.g. $150=(5 x $50)=$400! Avon Gold Executive Leader-As an Avon Executive Gold Leader you need $200 in personal sales with 10 1st generation orders. You will need $200,000 in total team sales. You will need two 1st generation Avon Silver Ambassador's for the Title Requirement. You will also need three 1st generation Avon Gold Leader's for the Title Requirement.You will receive a $20 Qualified Recruit Bonus and a 3% sponsoring bonus. When you advance to the title of Avon Gold Executive Leader you will receive an Advancement Bonus of $10,000 (deposited over the 4 following campaigns as long as you maintain the title). When you mentor someone who achieves the title of Avon Silver Executive Leader you will receive a Mentor Bonus of $5,000 (deposited over the 4 following campaigns as long as they maintain the title) You will receive a Generation Bonus of 10% for your first generation, 3.5% for your second generation, and 2.5% for your third generation Avon Representatives. You will also Receive a Gold Leader + Bonus of 3%. This bonus is based on the achievement title of Gold Leaders and above in your down line. As an Avon Executive Leader you can also qualify for the Executive Leader Cash Bonus of up to $400 per campaign! $150 for the initial 1st generation Gold Leader performing at that level and $50 for every subsequent 1st generation Gold Leader, up to a maximum of six, e.g. $150=(5 x $50)=$400! Avon Platinum Executive Leader- The title of Avon Platinum Executive Leader is the highest title any can receive as an Avon leader! As an Avon Platinum Leader you need $200 in personal sales with 10 1st generation orders. You will need $300,000 in total team sales. 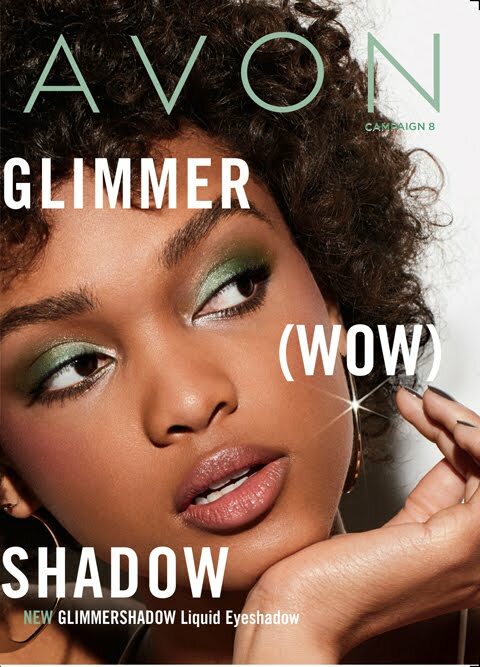 You will need two 1st generation Avon Silver Ambassador's for the Title Requirement.You will also need five 1st generation Avon Gold Leader's for the Title Requirement. You will receive a $20 Qualified Recruit Bonus and a 3% sponsoring bonus. When you advance to the title of Avon Platinum Executive Leader you will receive an Advancement Bonus of $20,000 (deposited over the 4 following campaigns as long as you maintain the title). 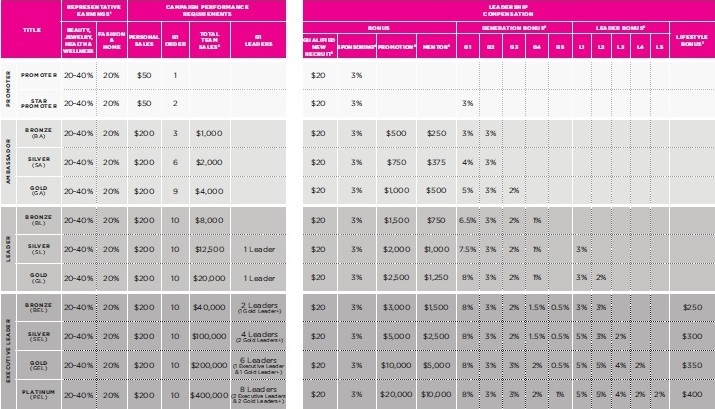 When you mentor someone who achieves the title of Avon Platinum Executive Leader you will receive a Mentor Bonus of $10,000 (deposited over the 4 following campaigns as long as they maintain the title) You will receive a Generation Bonus of 10% for your first generation, 4% for your second generation, and 3% for your third generation Avon Representatives. You will also Receive a Gold Leader + Bonus of 4%. This bonus is based on the achievement title of Gold Leaders and above in your down line. As an Avon Executive Leader you can also qualify for the Executive Leader Cash Bonus of up to $400 per campaign! $150 for the initial 1st generation Gold Leader performing at that level and $50 for every subsequent 1st generation Gold Leader, up to a maximum of six, e.g. $150=(5 x $50)=$400!